Wine charms are the worst. Oh, Lord. How do you feel about liquor labels, those old-fashioned sterling-silver necklaces that go on liquor bottles to identify what's what? I am partial to them. I think they can look pretty charming as long as they are silver and plain and not some new-fangled version with beads and other crap dangling off. And also, not on every bottle. Maybe on one or two so you can tell the vodka from the gin without having to sniff around like a confused drunk (as is my habit). What do you think, AL? Are they as bad as wine charms? On Christmas eve, my dad walked in ever-so-proudly with two boxes of Franzia "wine": burgundy for him and rhine for me! Then he spent ten minutes spouting the virtues of said boxes: "No messy corks to deal with," and "You don't have to pick up and pour," etc. in San Francisco. Big impact! Been lucky enough to score a few old French riddlers. I kept one for myself and just sold the others over the holiday. Stay tuned though. I'm on the hunt! Ack! I received some santa-themed, glass bead, wine charms as a gift! I'm not sure why... this same person gave me cat-themed, beaded wine charms 6 or so years ago and I don't really drink much wine at home and I don't entertain much and certainly not at Christmas with wine and only 6 people. Sigh. For the record I'm a fan of the liquor labels, if they're classy, but not when they're hung on the bottle that to booze comes in. They're for decanters. I am glad you're not doing a list post. They're overdone at this time of year. I don't like wine charms per say - it is just walking around a party declaring "Mine is the full one" offends people greatly. Bah humbug. I dunno Christmas just annoys me anymore. Maybe it's the forced cheer or my husband blowing more than I think we should be spending on toys for our sons. I actually did keep forgetting which was my wine glass at the obligatory family get together so maybe those charm thingys aren't such a bad idea...All the women there had lipstick on so a lot of the glasses were stained. The wine rack in the pic reminds me of an old electrical fuse box. Yeah, riddlers are charming but not a great way to store your wine. Corks are supposed to be exposed to both air and wine on the inside, as they are when laid flat. Riddlers hold the bottle on an angle so the cork remains entirely wet from the inside, which isn't the best for the development of the wine. If you're just using the riddler to hold the bottles for a week or two before drinking, well that's ay-okay. But if you're storing your bottles for a year or three, find another way to lay 'em down 'til drinking. On Christmas Day, my first thought, when my Mother grabbed my wine glass out of my hand and put a tacky wine charm on it, was "oh Decorno would LOVE this scene!" Really! I smiled to myself and enjoyed my little private joke. The glass had not left my hand for 2 hours and had my lipstick all over it - go figure! I thought we were playing the holiday edition of things that are wrong. I'll just sit quietly now. love that wine rack. 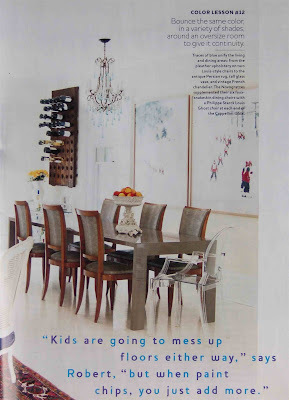 i saw that article in - can't remember what magazine - but i loved their whole house!! I'm new to your blog and just read your other post about the things you hate...hilarious! I agree with them all and I really hate taking my shoes off and those damn reindeer.